Despite the amusing memories evoked by the name of this retro sitcom from the '60's, the parallels to the current antics occurring now during the BDI bankruptcy are Kafkaesque, and pathologically pathetic. Whiz-Kid inventor and entrepreneur, Charles Hadley McAllister, finds a goldmine of average investors who have enough sense to see past the gambling casino known as Wall Street, but who are naive enough to believe that they can trust him to facilitate buying, selling and storing gold and silver bullion on his slick-looking website. (I think is was the photos of that impregnable vault that got most of them to bite on his scam, not to mention the guarantee that "these are individual not pooled accounts"). Fast forward 15 years, after paying himself $300K+ every year on a business where no books were kept, no accounts were allocated, and losing so much money that it was too embarrassing for him to file tax returns for the last five years. Yeah, Chad's a bright kid alright. Bright enough to know that these good times just won't last and he'd better plan ahead, just like all those average investors trusting him. Let's see, how about a fun little game of Three Card Monte and see if the Wheels of Justice will be able to guess where the fortune went? OK, let's roll! Escondida Family Trust, Dubai, Italy, Nucleo! Now my old pals, Dan and Joe, they can cook up some fancy sounding language to get me out of this mess and clean up the last bits of value, (though there's not much left from that last time I vacuumed the vault). Well, there's still the last bunch of checks my customers sent in before the whole thing went belly up. they can petition the court to eat those, (I'm sure those good ol' boys down at the Courthouse will go along 'cause they're dumber than a bag of hammers). Besides no one could ever suspect me of running a scam because I drive an old beater with 200K on it and live in a shack in Wembley, TX. But now, it's got to be getting a little tedious living down in Mom's basement with nothing to do but pick his nose and play video games. Poor Chuck! Mom is going to have to step up to the plate for me now or else I'll pick up that phone and get some family friends from Auburn University to come over and play spin the bottle, and that's a promise not a threat! Yeah, that's it! We'll get Mom to pick up the pieces from 'ol BDI, including all the remaining assets and patents for a paltry $300K. Dan and Joe will push the idea and make the Creditors Committee look silly for ever even suggesting that all I deserve now is to live in a cardboard box on the street with only a tiny little bowl of dog food to eat for the rest of my life. No Sirree! This is America and no one willing to act confidently while telling bald-faced lies will ever be left behind. Ha! And to think the aggrieved customer base is actually going to believe that we'll make good on all those bad plays they had with me. Compared to me and my Mom an' my buddies Dan and Joe, the whole world is a bunch of Dumb Clucks! Escondida Family Trust, Dubai, Italy, Nucleo! Now my old pals, Dan and Joe, they can cook up some fancy sounding language to get me out of this mess and clean up the last bits of value, (though there's not much left from that last time I vacuumed the vault). Seriously, has anyone done a forensic investigation on where all our "lost" money went??? ~$25 million doesn't just disappear into thin air. There must be some accounting trail to it. 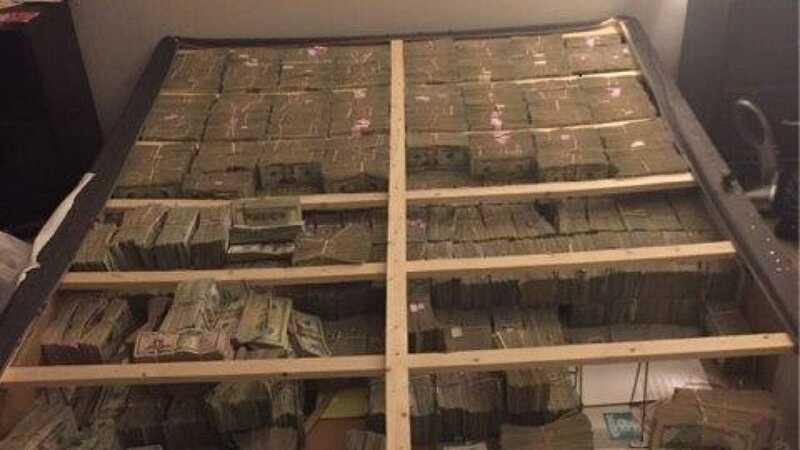 BOSTON (Reuters) - U.S. prosecutors on Thursday announced that about $20 million found under a mattress in a Massachusetts apartment had been seized after a Brazilian man was arrested for laundering money linked to a multi-billion-dollar global fraud. Prosecutors said TelexFree was a massive pyramid scheme, making little to no money selling its service while taking in millions of dollars from thousands of people who paid to sign up to be "promoters" and post ads online for it. I mean, first off, how does this chump even get to avoid filing taxes for 5 years and NOT GET AUDITED? WTF??? And then he just gets to say, "money all gone now, so sorry!" Well, it went somewhere - and much of it likely in traceable non-cash transactions, I would presume. On credit cards, trips, etc. But if he can't ballpark account for it - then doesn't that mean he still likely has much of it stashed away somewhere??? Before the court just takes his "honorable" word that it's all up in smoke, shouldn't they at least try to independently account for it all first? Yeah, sorry. It's all gone up in smoke and mirrors .Nobody is more sorry about it than I am. Lost about 75000 in this. OK there is another dude that lost half a million. So I got off lucky? But Where Is The Justice? But exactly, we're talking an estimated $25-$30 MILLION MISSING??? All that money had to go to buying some BIG ASSETS or maybe blown on some massive vices? Doesn't Charles have to at least provide a basic accounting list to where all the money went? Just to prove IT'S GONE and unrecoverable/recoverable, if nothing else? Assuming that someone is indeed going after him (Department of Justice, CFTC, etc. ), he would almost certainly have to do that in order to avoid whatever they were after (jailtime, money, etc.). However, it looks like the business was unprofitable since day 1, and he just paid the bills using stored metal. At 15 years, it goes down from $25M to about $1.5M/year. But what operating costs did he have totaling $1.5M/yr or more? It just seems like this is all just the tip of an even bigger, very fishy iceberg. Like how the h*ll could he file only 1 income tax return in 15 years of operation??? I would like an explanation from the IRS in this court case. Or were they in collusion with him...or just not care if he showed net annual losses and didn't owe them anything? Was this guy in the Witness Protection Program and is given cover on the lam or something? At the creditors' meeting, Joe Martinec said that Charles moved to Auburn. Another attorney present at the meeting said that Charles had moved to Auburn because one of his daughters lived there and he wanted to be closer to her (which of course doesn't really make much sense, as he has 2 younger children and a wife, and families don't usually just get up and move to where one child happens to go to college). Joe Martinec also mentioned at that meeting that Texas has an extradition treaty with Alabama, so the move is something that generated at least a bit of attention. I could be wrong, but I would suspect he heard that from one of the government agencies that is investigating. That doesn't seem like a fact that a bankruptcy attorney would happen to have in the back of his head (he said "I know", not "I think"). It is possible that Charles went to Auburn, and the rest of his family stayed back. When the McAllisters left Wimberley, TX around 2009, they moved to Austin, but managed to cover their tracks by buying their $1M house with a family trust (Bullion Direct acted as the lender). A Bullion Direct subsidiary ended up getting the note, and then there was a "deed in lieu of keys" type deal (the mortgage was forgiven in exchange for the deed), but the house was not sold for a few years after that. So it is not possible to tell when they left that house. Someone later bought the house and did some upgrades, but may have rented it out -- so it is possible the family is still living there. There is also evidence that some of the family was in Austin in mid-October in the middle of a school week. This suggests that the family (perhaps without Charles) may still be in Austin. Depending on how much his wife knew/knows, she may have been happy with the idea of him being far away for a while (or maybe not, as Charles' Mom appears to know quite a bit about what happened). I doubt that it would be hard to find Charles' Mom for an interview. I mean, clearly he must have used a bank to cash all those checks. Simply inspecting all his bank (and any credit card) statements for the past 17 years should reveal his basic money trail. He loved to spend money, and didn't know how to run a business. From 1999 through 2009, the tax returns show gross receipts of $329.5M and cost of goods sold as $336.2M. So that's $6.7M right there in the "not knowing how to run a business" category. Add to that $10.7M of expenses during that same period ($3.8M wages, $1.5M for officers, $505K rent, $3.4M other deductions...), and you're up to a $17.4M loss (assuming the numbers can be trusted, which I personally believe to be the case). That's all through mid-2010 (2009 tax year ending in 2010). I wouldn't be surprised. When they owed customers $21M of metal in 2010, Charles and his gang were looking into buying a gold mine for $16M (with a $4M cash downpayment). Where they were planning to get $4M is anyone's guess (and hopefully there are some people on the government payroll working on such guesses as we speak). Like how the h*ll could he file only 1 income tax return in 15 years of operation??? The same thing happened with NWTM, where NWTM and its owner went years without filing. It does not make sense. So, if the IRS had even remotely been doing their job, none of this would have happened. Neither Chucky or NWTM likely would have been able to run their scam much past the first year, if they continually showed such huge operating losses. Red flags would have been raised as to how they were falling too far in debt too fast to ever become solvent. I mean, doesn't the IRS have to answer why they let both of these companies skate by for a DECADE without filing a tax return? WTF??? Don't they bear some liability here for complete neglect of duty? The catch is that the tax system in the U.S. is based on voluntary compliance, where it is expected that everyone will both file taxes if needed and report their income/expenses properly. The IRS audits people/companies both based on information in returns and randomly. But, my understanding is that the audits are done in large part based on how much money they might get. After all, why spend perhaps $500 (or $5,000) auditing someone to get $200 more in tax money? Or to give someone back $50 because they forgot a deduction? And in this case, they wouldn't have received any money. So even if they *knew* that Bullion Direct hadn't filed tax returns, if they had an idea of their financial situation, it wouldn't have been a high priority. And since Bullion Direct never filed taxes, they likely were never on the IRS' radar. Without someone going to the IRS and saying "Hey, check them out!" they wouldn't look any different than a one-person operation that didn't even make a single sale. The NWTM one is more baffling, though, where the company had been in business for some 30 or so years, and apparently had been filing tax returns up through the end. That the IRS definitely should have followed up on (as they *knew* from previous tax returns that the company was doing in the ballpark of $100M/year in sales). Sorry, but I just don't buy the "didn't know how to run a business" view. He was a crook. A con man. A thief. A liar. A tax cheat. It is astounding to me that he's not in jail. He should be. It's a game. The average Joe gets ripped off of their life savings and the crooks, including the lawyers and "experts," all get rich. They simply divide up the money of the folks who have been ripped off. It's a travesty. The "didn't know how to run a business" explains the beginning. You are right that it does not explain it all (anybody old enough to be running a business knows that if you owe $20M more than you have, and you take money for orders you cannot fulfill, it's wrong). Just because he isn't in jail right now doesn't mean he won't be. I cannot imagine that the U.S. Attorney is so incompetent as to ignore this or let it slide (although I know there are some who do not share my view). IIRC, it took about 17 months from the time The Tulving Company shut down until it was known publicly that the U.S. Attorney was going after the owner. And investigations into The Tulving Company began at least a few months before he shut down (unlike Bullion Direct, where there is no indication anyone was investigating until around the time it shut down). It's been 18 months since Bullion Direct filed for bankruptcy. Every case is different. With Tulving, he was in hiding for months, and lawyers could not serve him (whether investigators knew where he was, or cared that he was hiding, is unknown). Charles is much more visible: he has a wife and 3 kids that are making no attempt to hide, and a mother and stepfather who are also making no attempts to hide and are deeply involved with the "new" Bullion Direct. But on the other hand, where the owner of The Tulving Company made no attempt to fight the charges against him, Charles might (he has taken out a lot of money from Bullion Direct, and while I doubt he has much money, he might, and could have the resources to put up a lengthy court battle). The bankruptcy system is pretty bad, with lots of lawyers and professionals happy to live the high life at the expense of victims. I don't care if a lawyer make a lot of money off of a bankruptcy of an individual where credit card companies and a mortgage bank lost money, but when there are individuals who are victims of a crime like this, it just isn't right. JG, you mentioned that it was 17 months for Tulving until they went public with the criminal prosecution and yet you also said it has been 18 months since BD went under. When do you think it's time to think that perhaps there will be no charges brought up against CM? Also, might the fact that the bankruptcy court awarded the purchase of BD to a family member sort of make it seem like there really wasn't any wrongdoing in this failure and that as far as the courts (and investigators?) are concerned, CM was just a poor businessman? JG, you mentioned that it was 17 months for Tulving until they went public with the criminal prosecution and yet you also said it has been 18 months since BD went under. When do you think it's time to think that perhaps there will be no charges brought up against CM? I don't know enough about the criminal justice system to really say. One attorney website I looked at (intended for criminals, not victims) explained that often the U.S. Attorney won't even tell the potential criminal that they have stopped investigating (so they are waiting, waiting, waiting for the indictment that may never come). The one definite answer has to do with the statute of limitations, which appears to be 5 years (from the end of a conspiracy to indictment). That is when you would know with near certainty that he was not going to be charged. Also, might the fact that the bankruptcy court awarded the purchase of BD to a family member sort of make it seem like there really wasn't any wrongdoing in this failure and that as far as the courts (and investigators?) are concerned, CM was just a poor businessman? Only if the investigators are incompetent (in my opinion, at least). A court order has nothing to do with someone is guilty or not.